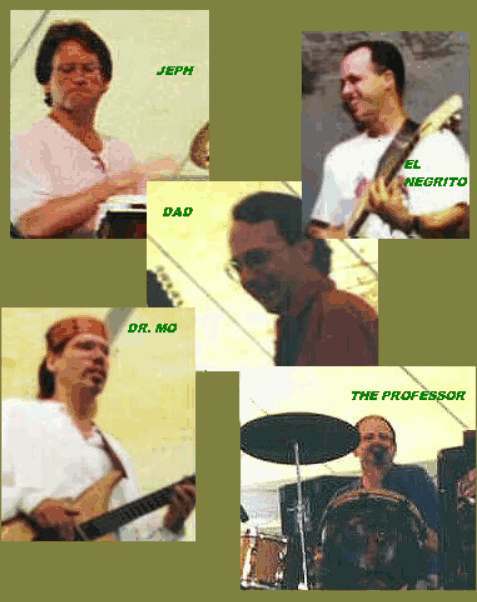 This is a collage of the band performing at a Bethlehem MusikFest "Platz" in 1997. The pictures are from the early show, at 11:00 AM. It was sort of cold and wet that morning, and the beer tentz didn't open til noon. It looked pretty rough, but Namaste hung tough. Dad had a great time playing the Yung Chang. The sound system was clean and clear. The performance was filmed for a benefit re-broadcast, and the crew and editing made the band look like rock godz. By the time it was over, the crowd in the platz was wide awake, and Namaste was ready to hit the fair. By the time Namaste played their second show at 8:00 that evening, they had covered a lot of ground. Somehow, a purple parrot named jimmie had taken up residence on Dr Mo's kufi. El Negrito discovered the wonder of 100 wattz of power, and although it had been a long, hard day of entertainment the band reached deep down and pulled out another one!